World leaders meet in Paris this week for COP21 climate change meeting. PledgeVideo.org promises to help "stateside" with free online tools for individuals and businesses of any size for planning ways to reduce carbon emissions from business travel. As world leaders meet in Paris this week to discuss climate change PledgeVideo.org helps businesses understand what we can do stateside to reduce carbon emissions with videoconferencing. PledgeVideo.org hopes that turning the conversation inward and focusing on what can be done at home collectively will help individuals and businesses take advantage of "low hanging fruit" such as video conferencing technology. One of the easiest ways to reduce your personal or organizational carbon footprint is to reduce travel. As the costs for video conferencing technology continue to become more affordable, implementing effective online conferencing plans can easily produce amazing ROI oppurtunities and help reduce carbon emissions at the same time! It's really a win-win for everyone and this time the environment is included! In this article we will review the PledgeVideo.org tools you can use to determine your organizations carbon footprint. Rather than focusing on the climate tipping points and raising global temperatures our world leaders are grappling with in Paris I'd like to focus on something any individual, small or large business can implement to reduce our carbon footprint regardless of the actual hardware or software that is used. 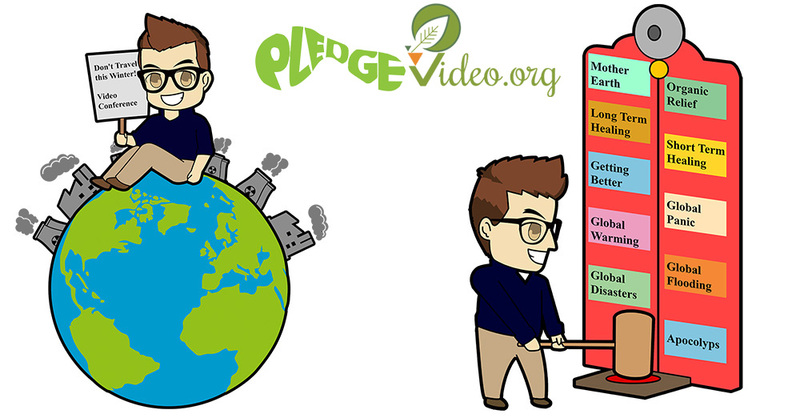 PledgeVideo.Org is a free online tool for companies to use and promote reductions in business travel and "carbon offet" using web video conferencing. With the growing online video conferencing industry making huge strides to reduce travel in the corporate world, a easy way to calculate carbon footprints reductions was needed. Please share this free tool and submit your results and display PledgeVideo.Org certificate badge! Hello IT Professionals and Environmental Leaders! Today we will be taking a quick look at PledgeVideo.Org and the Carbon Footprint reduction calculations you can use to show reducing business travel and the result that has on our environment.